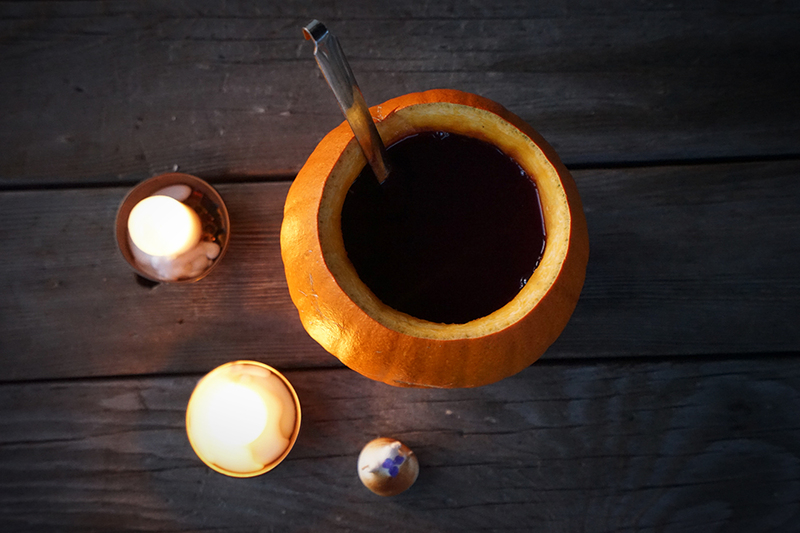 A quick and easy Halloween drink for kids, spikeable for the adults! 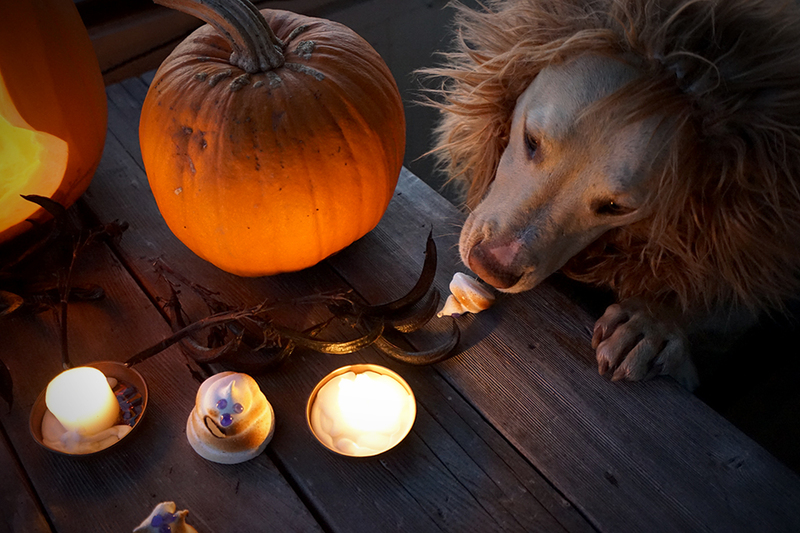 Most Americans celebrate Halloween in some form or another. 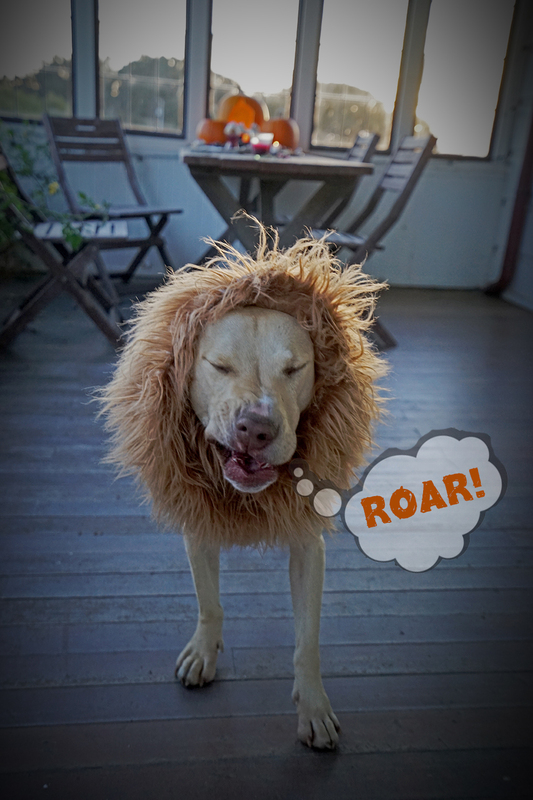 Whether you are giving out candy to trick-or-treaters, dressing up for work or partying it up somewhere festive- hoping to win best costume; we all tend to get extra jolly on this dark evening. I’m always trying to get mangoes in on the fun, but as I teeter more on the verge of boundaries these days then pushing through them, I recognize, we can’t incorporate mangoes into every single thing- one has to be clever about it…… it has to be tasty and not scream “Im trying too hard.” This is my Halloween attempt. I realize no wants homemade candy or dried mango roll ups on Halloween, nor do most care to put forth hours of their time to make elaborate homemade sweet delicacies, like passion fruit -mango caramels by legendary chocolatier Jacques Jenin. Most want convenience and traditional candy treats. Kit Kats and smarties. This is the reality of Halloween. Last year I came up with Mango Caramel 3 Ways, which was actually pretty genius and great for fall in general, but it still felt like too much work for Halloween, especially since Halloween is often on a weekday. This year I decided I wanted something super easy that could be enjoyed by kids and adults. Something that was seasonal (of course) and could be made in one pan that tasted awesome and that was spooky clever and kitschy, like Halloween wants things to be. Plus I toss in one of my clever tricks for those that want to put forth a little extra effort. 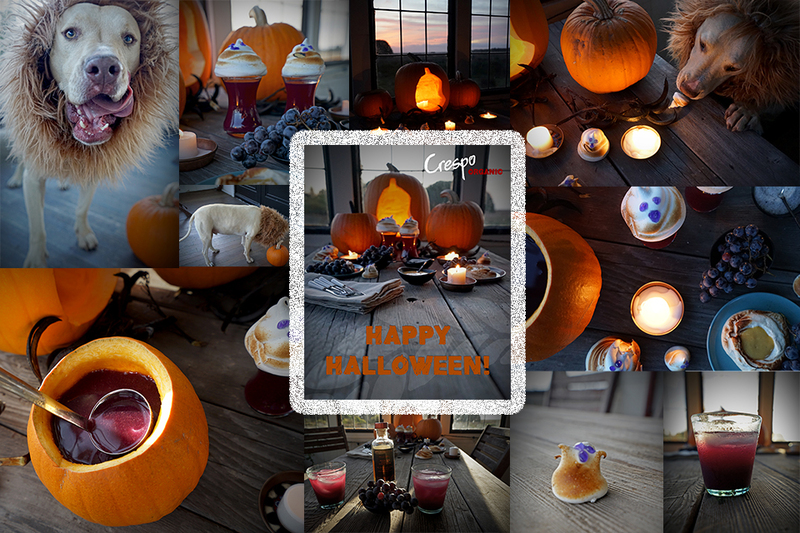 This recipe/idea, Spooky Goblin Blood Punch & Ghost Toppers, is a good one- read on, please! 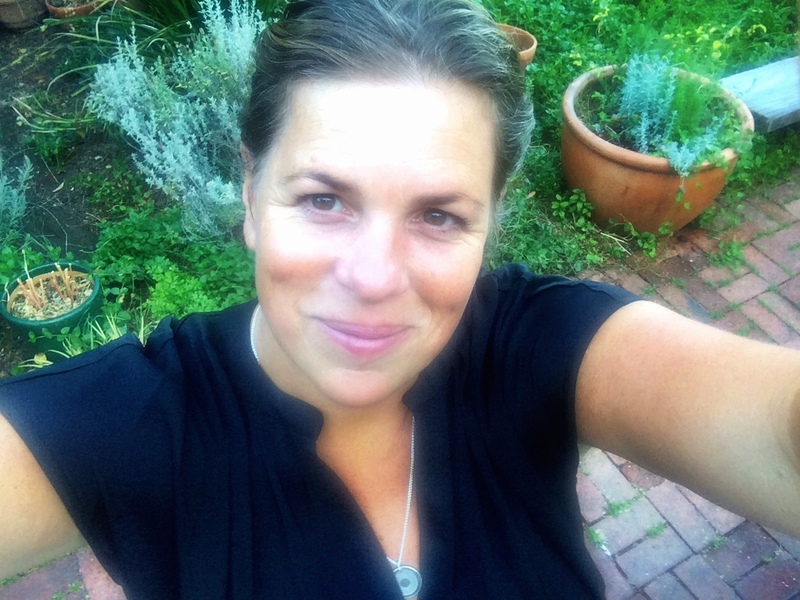 As I re-visited this article I had flashbacks of my creative juices at that time and my creativity and ideas for those very same recipes and ideas began to morph in to this version. Often times the recipes we made once, change, no different than our personas- they evolve, morph, are influenced (negatively and positively), modernize and often our expertise and our technique change (hopefully expands and improves) and thus we start to do things differently than we used to- recipes are the same – at least for me. 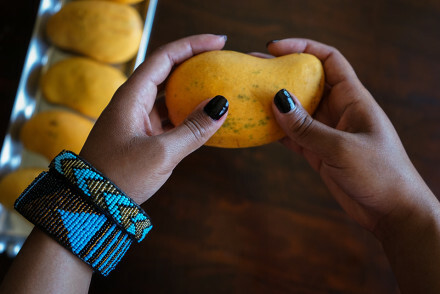 My original Jack O’ Lantern Punch was really good and my new version, using mangoes as the sweetener and giving it more spice, make it not only healthier (less sugar) but better overall flavor. 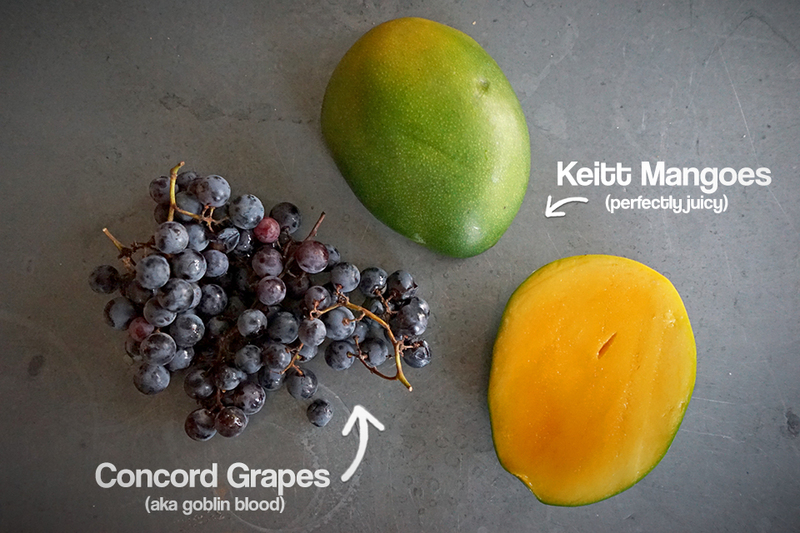 The mangoes mesh perfectly with the concord grapes and give their earthiness a slight tropical uplift that still feels fallfish due to the custom pumpkin pie spice blend that I use. 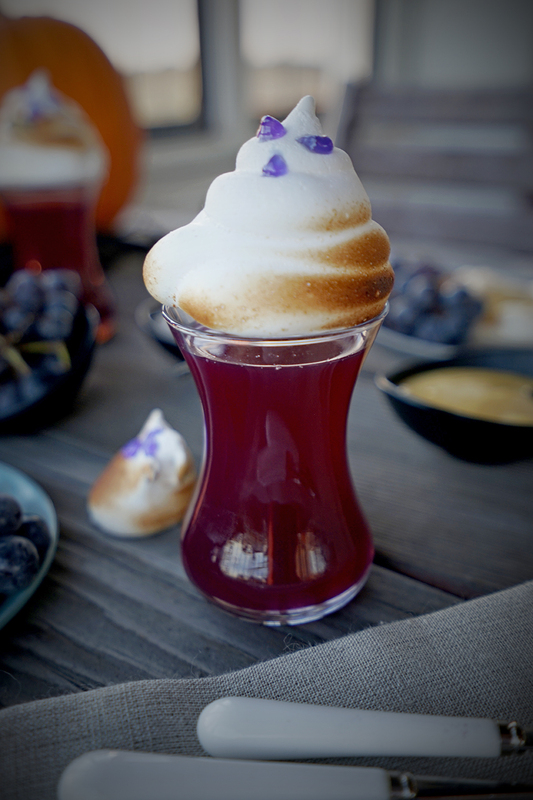 If you have extra time -and will- I have tossed the recipe in for my new awesome invention – Flamed Ghost Toppers, because who doesn’t need a good merengue ghost topper on their drink? I mean even Inca the Lion is in love with these sugary ghosts! The ghost toppers are the hardest part of this recipe, but the most fun. The recipe is pretty simple and pretty hard to mess up, I highly recommend it! 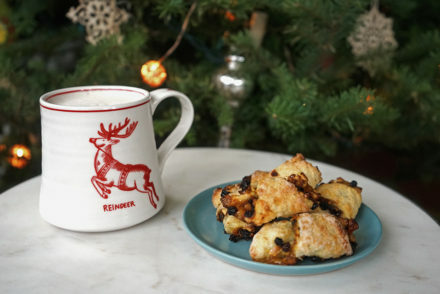 You will need a piping bag with a regular round tip or no tip. If you don’t have a piping bag, you can make your own. Pre Heat oven to 200 F.
Using an electric mixer or kitchen aid with whisk attachment, beat the egg whites on high speed for about 2-3 minutes until they are white and frothy with lots of bubbles. While the machine continues at high speed add the sugar one tablespoon at a time, allowing for the sugar to mix into the egg whites fully before adding the next. Once the sugar is fully incorporated, and while the machine is still moving on high speed, add the cream of tartar and continue to whip the egg whites until stiff peaks form. It can take a while for the egg whites to reach stiff peaks, the sugar has to dissolve fully and temperature and speed are variables to the exact timing. Usually about 8 minutes. The mixture should be thick and when you turn the beater upside down and the egg whites should hold a stiff peak with zero movement. If your egg whites are over beaten they will start to get “liquid-y” again. One way to try to salvage your whites is by adding another – room temperature- the theory is that the extra egg white allows you to try and re-do the process. 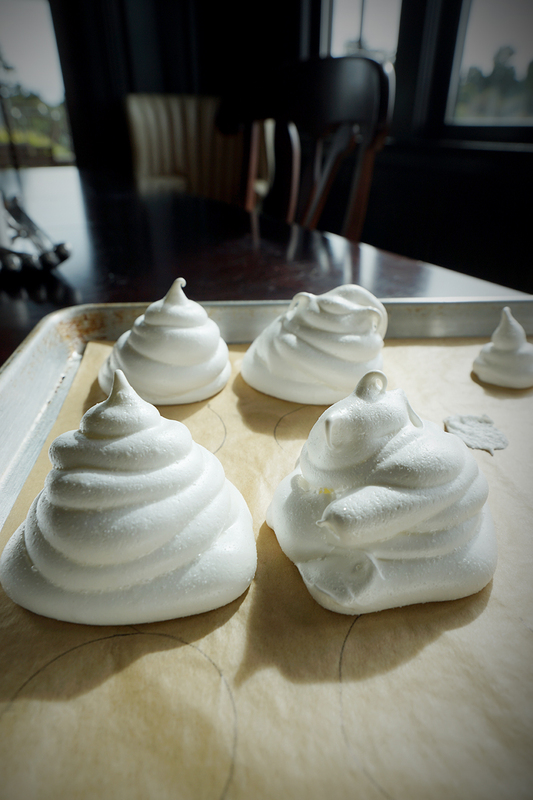 Once your meringue is ready place it in a piping bag. Once your bag is full press the mixture out into a round circle on a baking tray lines with parchment paper. Press the merengue into a thick circle large enough to cover whatever cup you are using (I draw outlines on the parchment paper first) Make a few layers of the merengue, by pressing down and then lifting up with the merengue bag. You can make a few smaller ones as well for fun. Fat ones, skinny ones, be creative, it’s more fun with they are not totally perfect looking. At this stage you can also make little arms, tails etc, by gently puling on parts of the ghost and releasing. Use one ghost as a “sacrificial ghost” and try and different techniques before moving on to the others. Place them in the oven and bake them for about 60 minutes. Once baked, remove them from the oven and cool completely. They will get hard as they cool. Once cool use the icing to add eyes and mouths. At this stage you can leave them as is or give them a little flame with your kitchen torch as I did. I like that taste of burnt marshmallow which is why I did it, but you can leave them as is if you don’t have a kitchen torch. 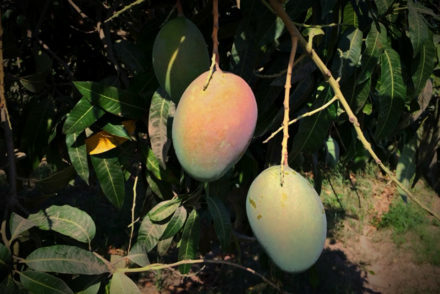 In a large sauce pan combine the mango, the grapes, the spice blend, the mango pit syrup and 2 cups of waters. Stir and bring the mixture to a boil and then reduce temperature and simmer for about 10-15 minutes or until the grapes are totally soft and broken up. 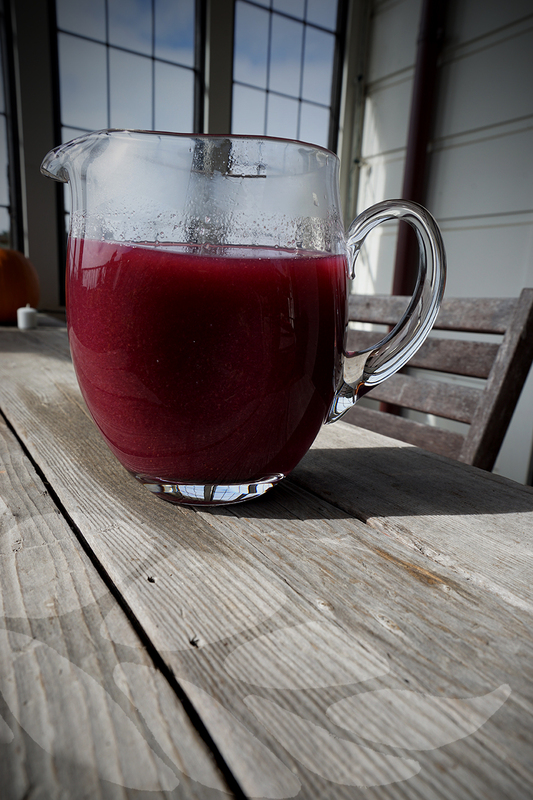 Strain the mixture into a large bowl or pitcher, pushing down on the grapes and mangoes with a wooden spoon as to extract every drop of juice (aka goblin blood). Mix in the remaining water, stir and chill. 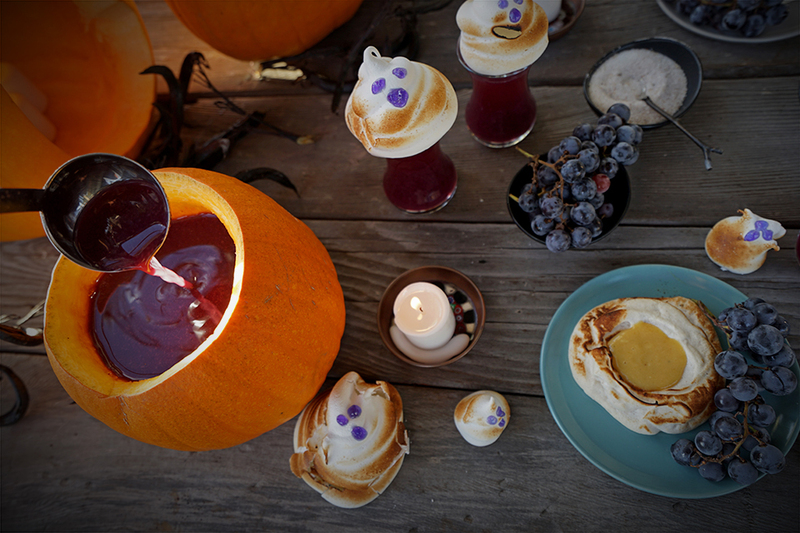 Serve your Goblin Blood Punch in a hallowed-out Sugar Pie pumpkin if desired. Top each glass with a Ghost Topper! *Nissa’s Pumpkin Pie Spice Mix – Mix together the following ground spice: 1 tablespoon cinnamon, 2 teaspoons nutmeg, 2 teaspoons ginger, 1 teaspoon all spice, 1 teaspoon cardamon, 1 teaspoon mace, 1 teaspoon black pepper. 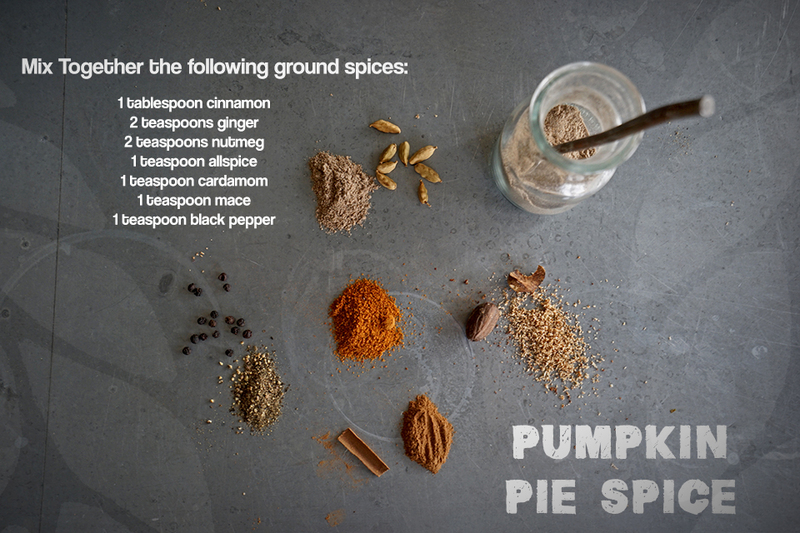 *Pumpkin Pie Spice Blend: Mix together the following ground spices; 1 tablespoon cinnamon, 2 teaspoons ginger, 2 teaspoons nutmeg, 1 teaspoon allspice, 1 teaspoon cardamom, 1 teaspoon mace, 1 teaspoon black pepper. I like to toasts the fresh seeds first and then hand grind with a mortar and pestle, unless I’m feeling lazy in which case I use my already ground spices! For a special treat, since you are in the merengue making mood, try my Autumn Spiced Pavlovas with Mango Curd and Concord Grapes for a sweet treat! and for the adults – SPIKE IT! 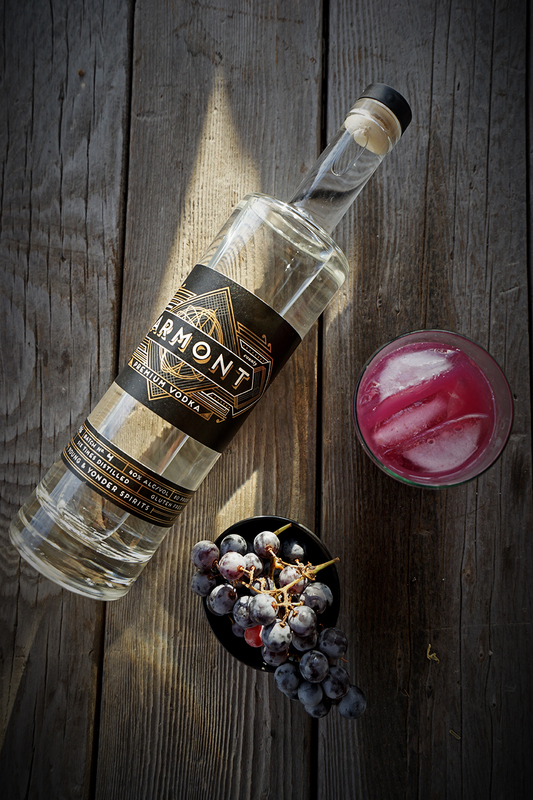 The punch goes well with bold booze, I enjoyed it Armont Vodka a corn-based vodka from Young & Yonder Spirits, but I also tested it with bourbon, spiced brandy, gin and whiskey and they are all good- pick your poison!